In Circuit Patient Pressure Manometer and Safe-Sigh Circuit - JD Medical Dist. Co., Inc. The In Circuit Patient Pressure Manometer is the safest way to accurately monitor the circuit pressure using non-rebreathers and circuits that do not utilize the manometer on the anesthesia machine. It can also be used to add pressure monitoring capabilities to older anesthesia machines that lack manometers. 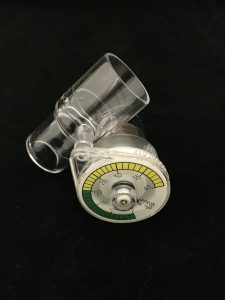 The In Circuit Patient Pressure Manometers has a standard 22mm connector that can be used on all circuit types. Combine the In Circuit Pressure Manometer with the Patented Safe-Sigh Non-Rebreathing system for the ultimate in patient safety. 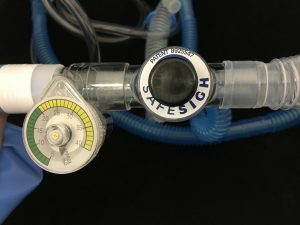 The Safe-Sigh Non-Rebreather has a built in one touch valve to safely give the patient a breath. The one touch valve immediately opens after being depressed. 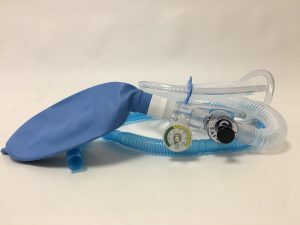 Combined with the In Circuit Pressure Manomenter this non-rebreathing set up is the prime set up to minimize the risk of barotrauma in small patients.